Overview: >Monex Precious Metals has been dealing in precious metals and IRA eligible gold and silver coins and bars for over 40 years. Established in 1967 by Louis E. Carabini, Monex was the first company to enter precious metals investment industry. Since then, the company has grown significantly and has expanded its portfolio to include gold, silver, palladium, and platinum. Despite being the very first precious metals investment company, Monex doesn’t offer eCommerce services to its customers. The customers can browse through the product range and view live prices on the website, but in order to place an order, the customers must contact the company’s account representatives on its toll free number. The precise ‘About Us’ section of the company provides information about Monex’s history and its progress through the last 40 years. This section also highlights the company’s ability to maintain long-term business relationships with its clients which, in our opinion, is the unique selling point of the company. It is mentioned on the company’s website that Monex gets 80% of its business repeat clients and the rest from referrals. In addition to this, the company also has a reputation for being the pioneering precious metals investment company. The company uses its experience, expertise, and resources to serve the needs of individual investors. The company offers a wide range of products; however, not all of them are IRA-eligible. Also, since Monex is primarily geared towards expert investors, it offers many of its products in bulk quantities only. Gold and silver coins – Vienna Philharmonics, American Eagles, Canadian maple leafs, Canadian howling wolf, South African Krugerrands, Canadian growling cougar. Click to see how Monex stacks up against the best gold companies! Monex maintains a professionally designed website that looks corporate and stylish. The homepage is content rich and looks like the ‘Resources’ page. It contains a slider on the top which displays updated market prices for gold, platinum, silver, and palladium. In addition to this, the homepage also has ‘special offers’ and ‘about us’ sections. Since Monex does not offer eCommerce services to its customers, no information has been provided by the company about shipping charges. Each product page is accompanied with a detailed product description in the form of long paragraphs which can be difficult to read for an online consumer. The ‘About Us’ page is located deep within the ‘Contact Us’ dropdown menu, and therefore, can be difficult to explore. 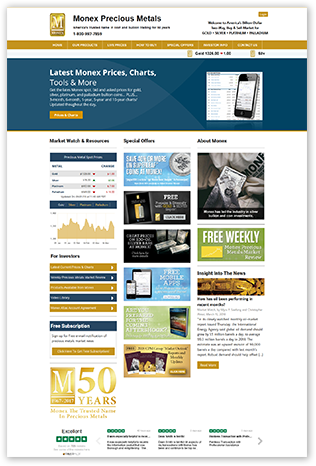 The resources page, as mentioned already, is content rich and contains a variety of sections, including video library, DVD programs, precious metal investment guides, and gold value insights. Monex has poor social media presence with about 50 followers on Twitter and only 529 likes on Facebook. We browsed through the company’s social media profiles to find out that there is no recent activity on the pages. Also, the website doesn’t contain social sharing buttons.